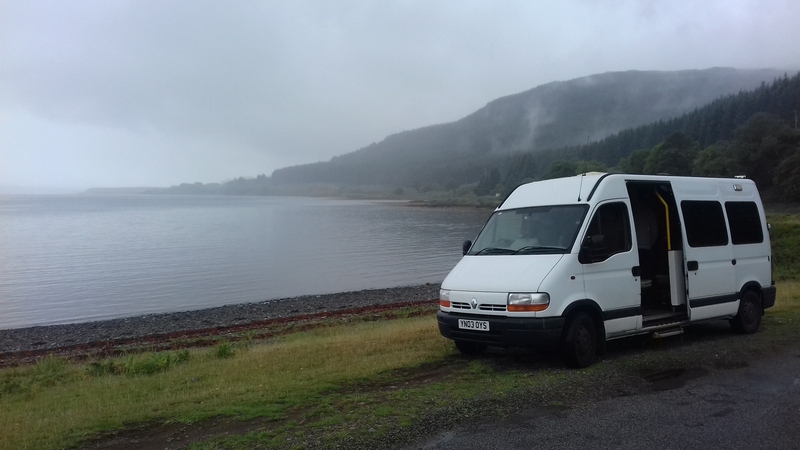 Our latest tour took us to the Isle of Mull, Easdale Island (near Oban) and Strachur (near Dunoon). 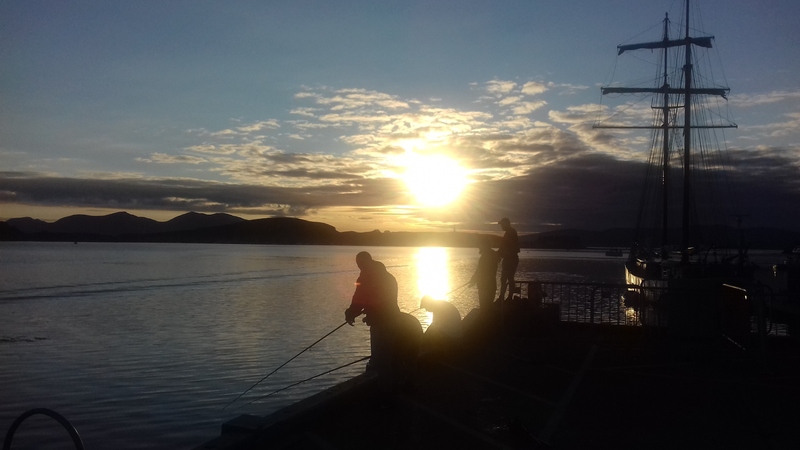 On Wednesday we travelled up to Oban to save us an early start on the Thursday for our ferry journey to Mull. 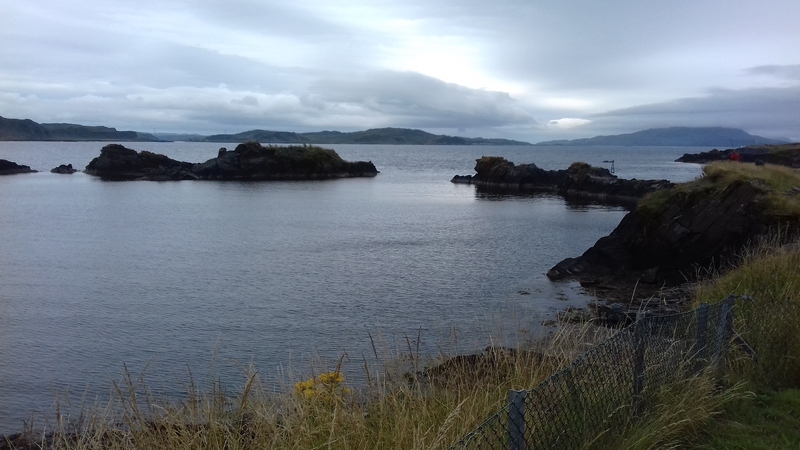 We drove down towards The Sound of Kerrera and Kerrera Island, just south of Oban. A beautiful spot. As you can see, we still have the unbelievable, beautiful sunshine! 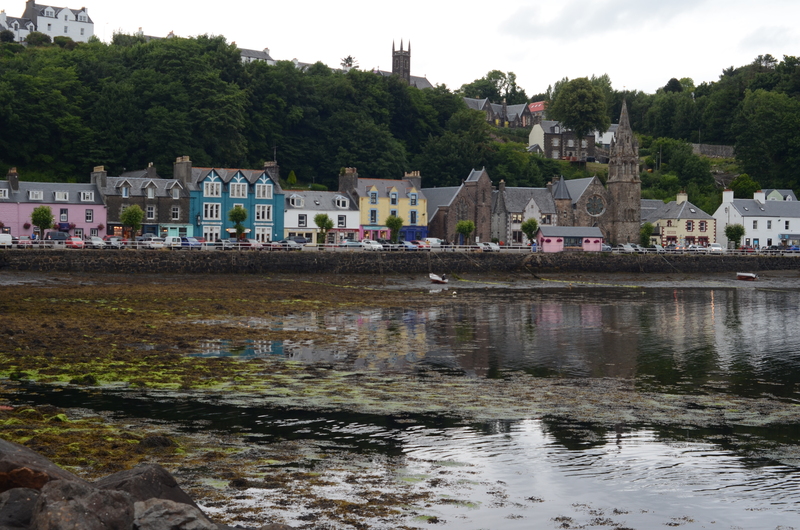 On Thursday morning, we explored more of the area and had an early lunch stop (our ferry from Oban was at 2pm). 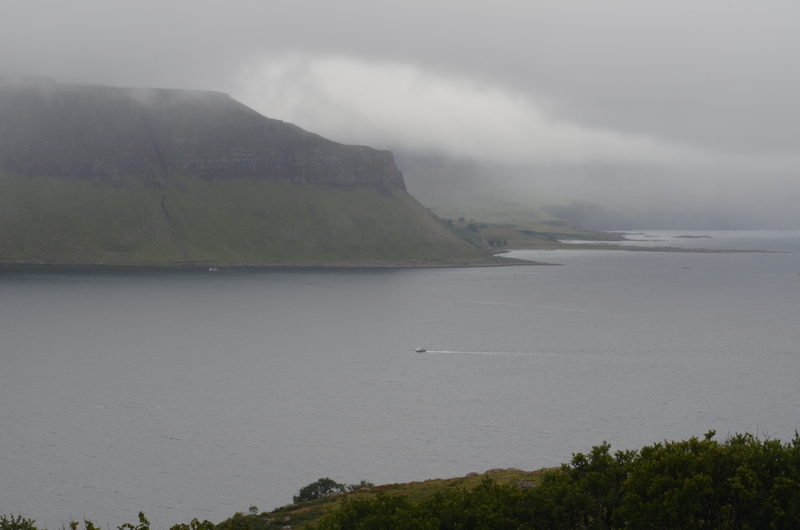 We arrived just before 3pm, so we had the rest of the day and evening, and Friday up until the concert, to explore the island. 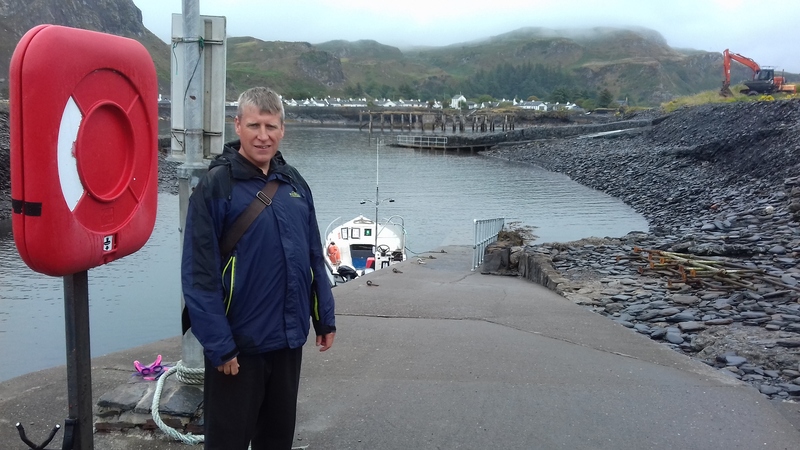 We’d both been there before…..some 28 years ago! 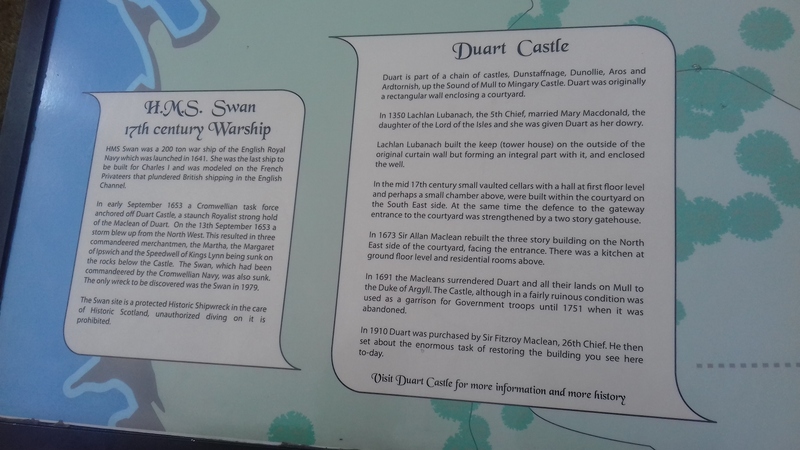 Our first stop was at Duart Castle near Craignure. 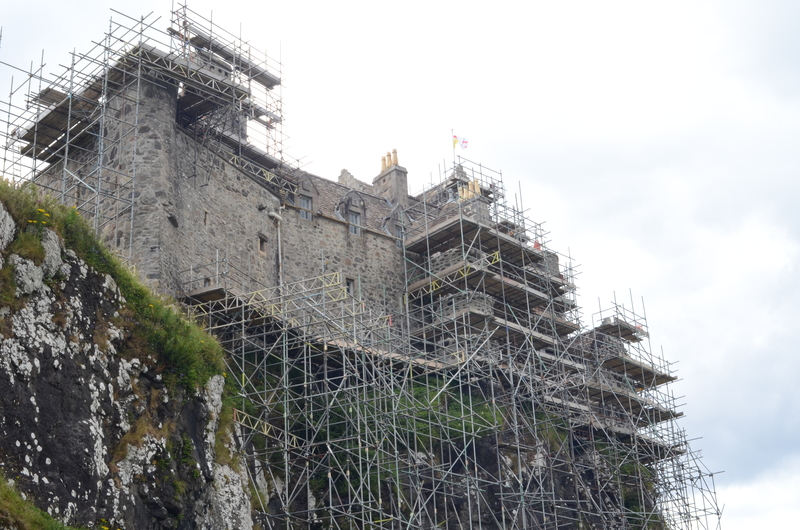 There is some long term restoration work at the castle. 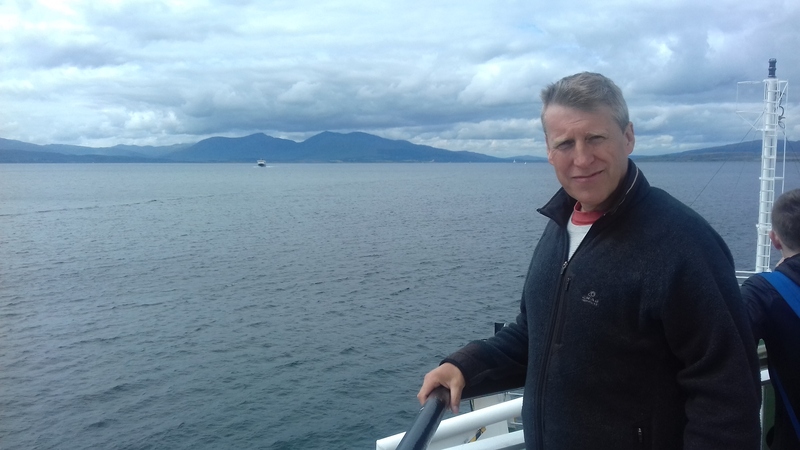 We met a very nice Australian guy on the ferry back who had been helping out with the fund raising for the repairs. 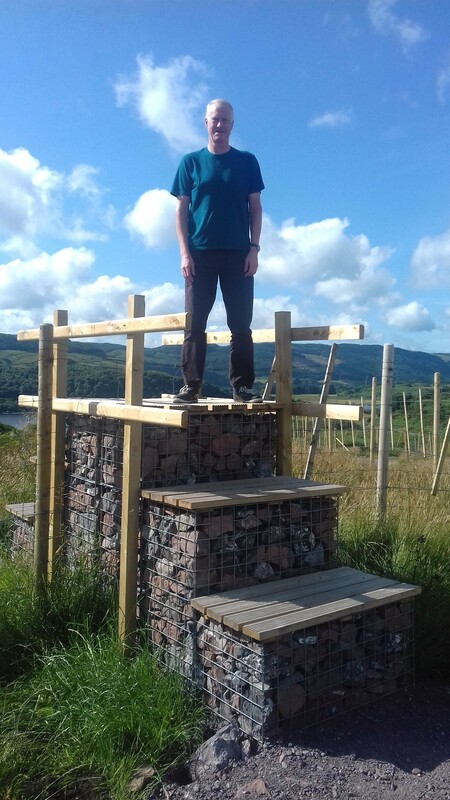 He is a Maclean and comes over every year to help, and to visit the Tobermory Highland Games. 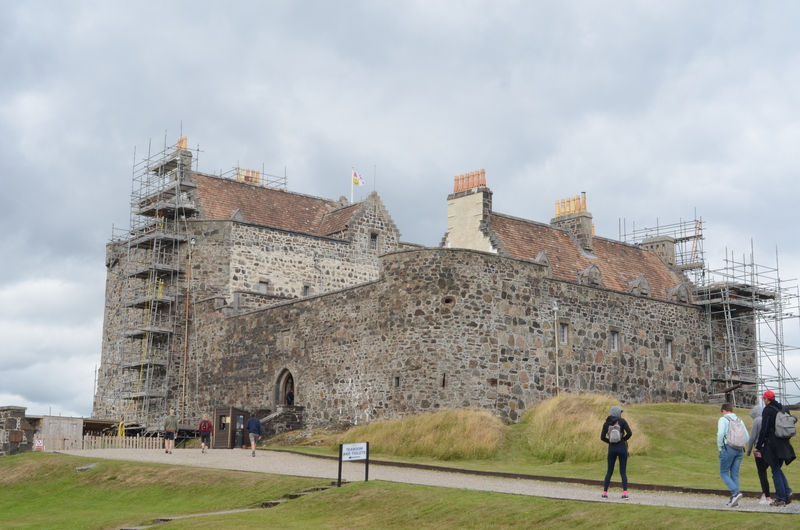 Lots of people, particularly “Macleans” regularly donate money for this restoration work, some with regular monthly amounts, and some with very large donations! 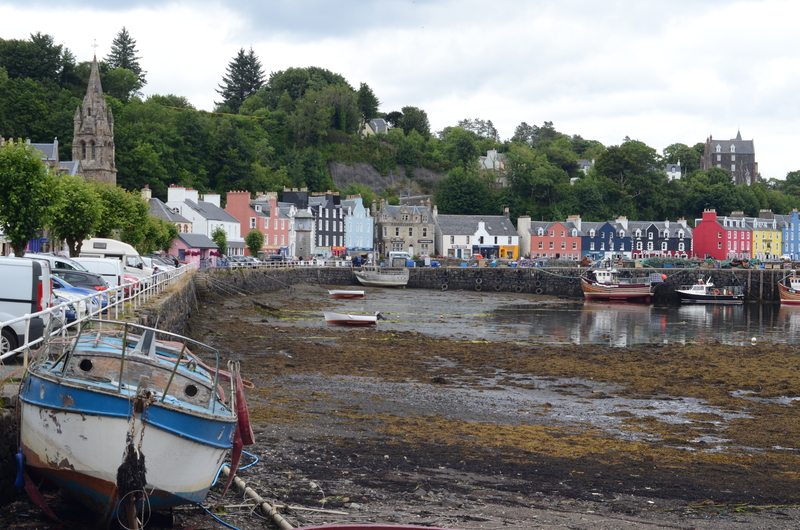 We then drove to Tobermory in the north of the island. 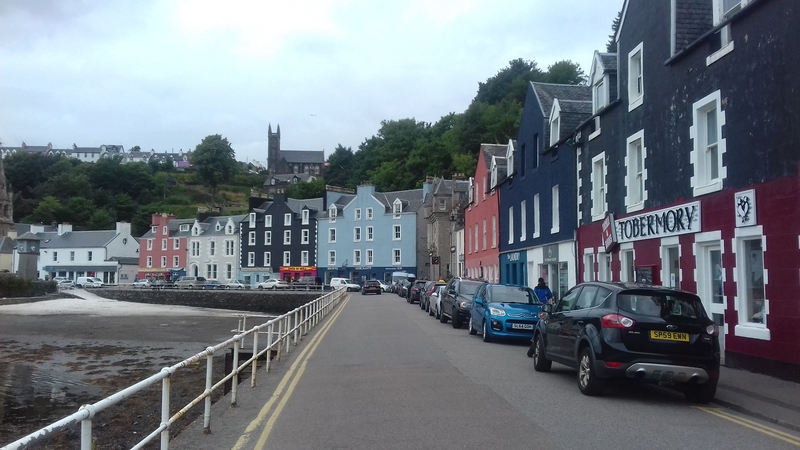 Famous for its brightly coloured buildings, and for children, the children’s television series “Balamory” which was set there (starring Miles Jupp in his first “break”!). 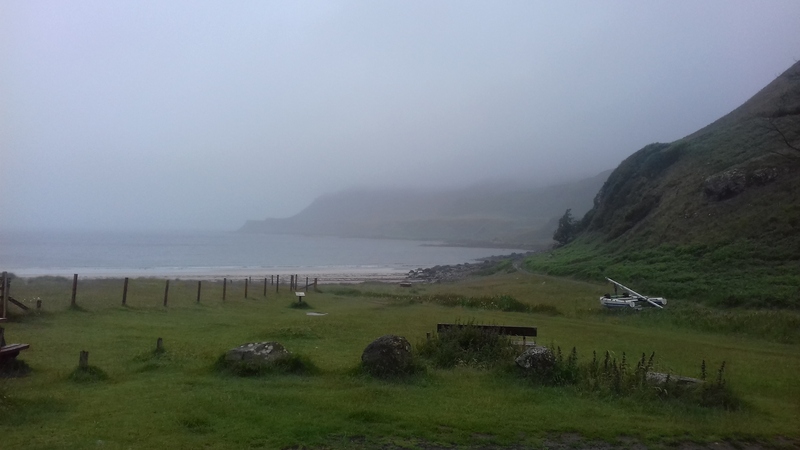 We headed on round to the west side of the island to Calgary Bay, as the rain started. We can’t complain. 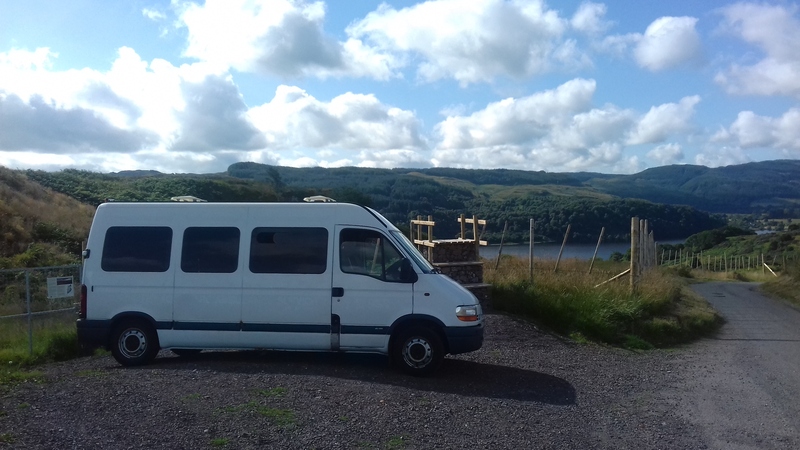 We’ve had non-stop sunshine for months now on our tours around Scotland! 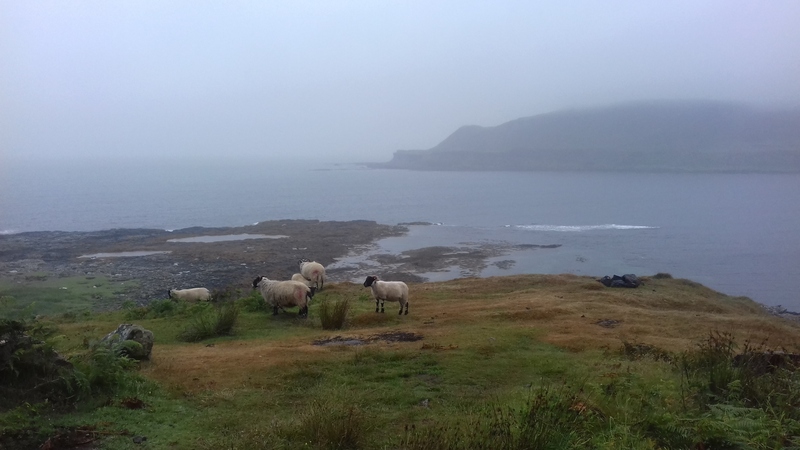 We got a view of the Isle of Coll at the top of the hill, but by the time we’d reached Calgary Bay, there was too much low cloud & mist to see it. It is only 6 or 7 miles away. 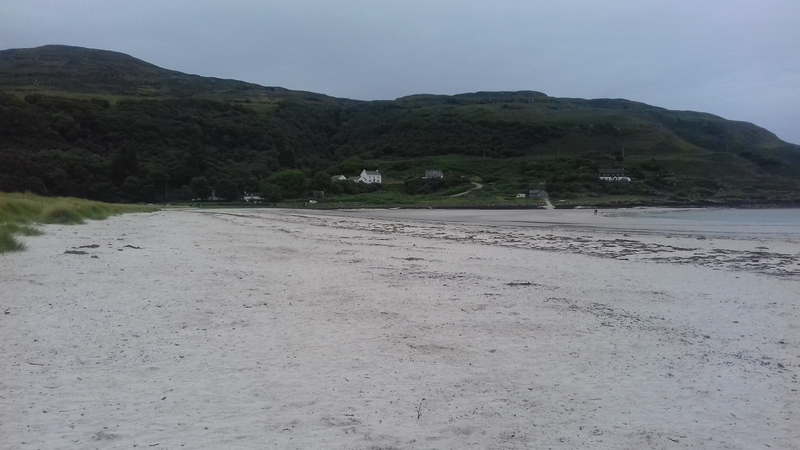 Calgary Bay. 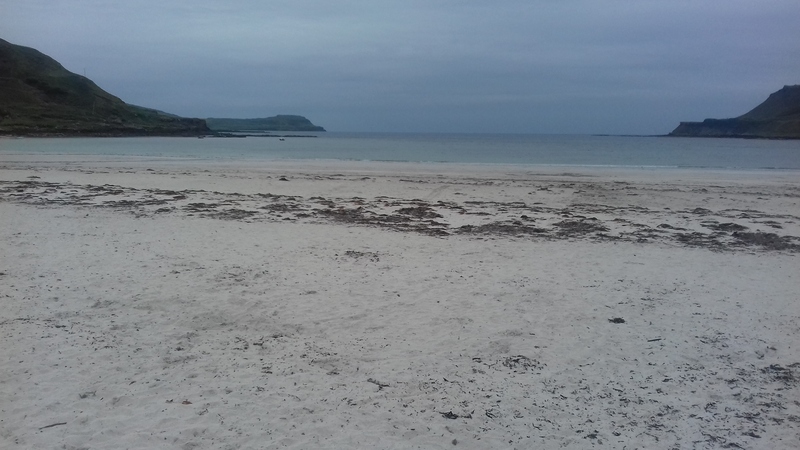 The Isle of Coll would have been visible be in the distance out to sea on a clearer day. 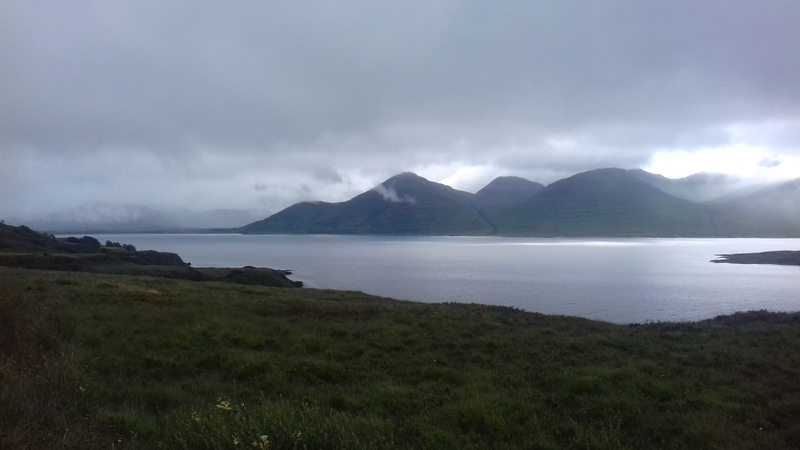 The next day we headed south around the west of the island, passing Loch Tuath and onto Loch na Keal. 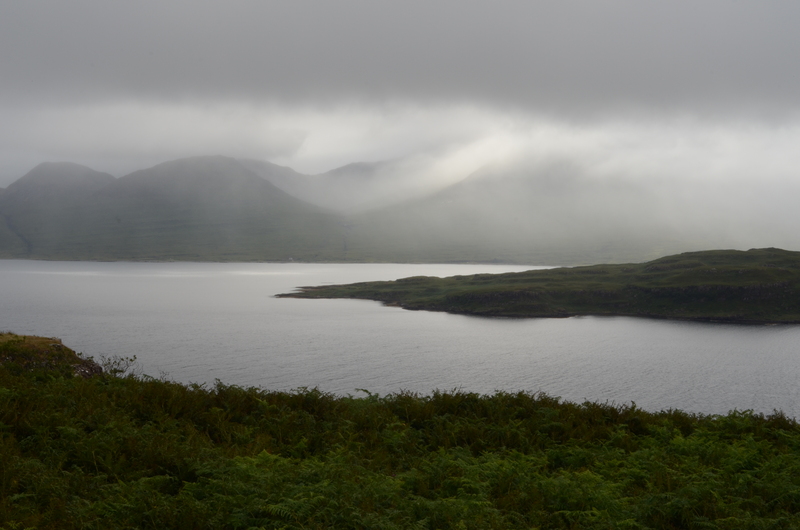 The road runs around the whole of the east end of this loch. 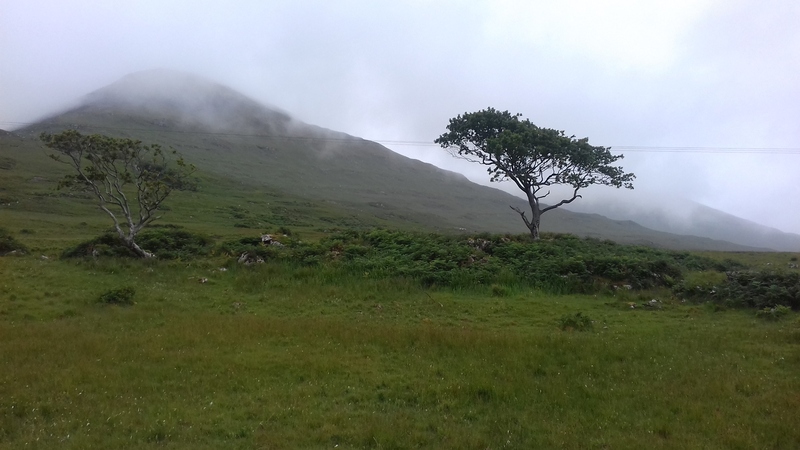 The rain and low cloud made stunning views of the mountains of Beinn á Ghráig, Ben More, Bein na Srèine, Creach Bheinn and Cruachan Dearg as the sun tried to find a way through. 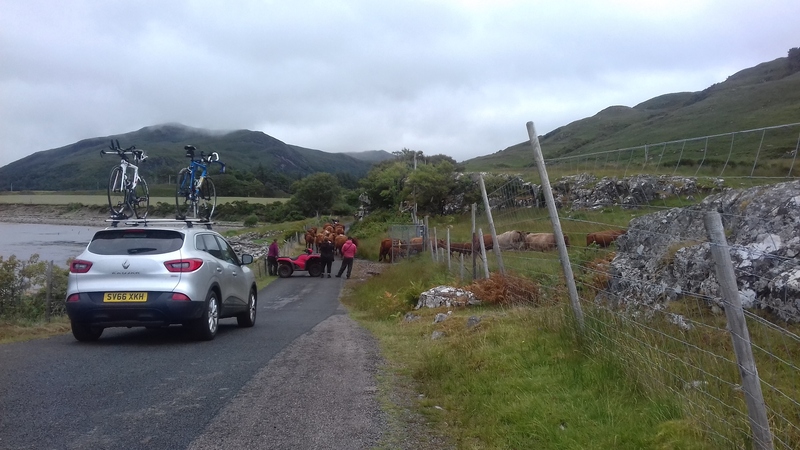 Don’t you just hate it when the roads are congested!!! 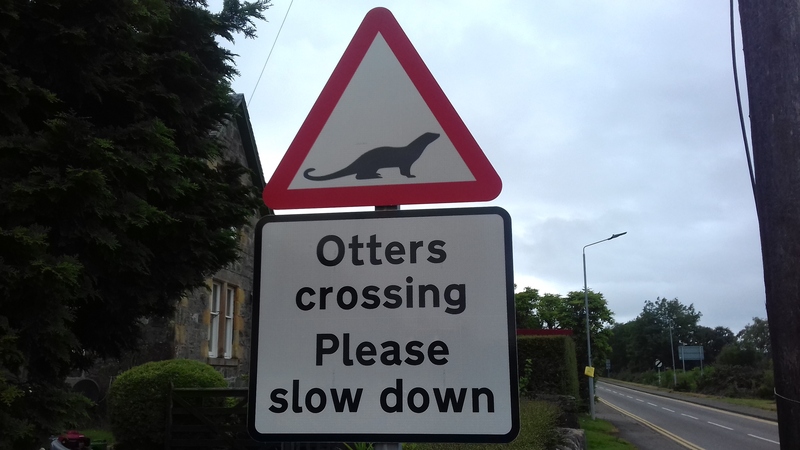 Otter spotting is common around here. 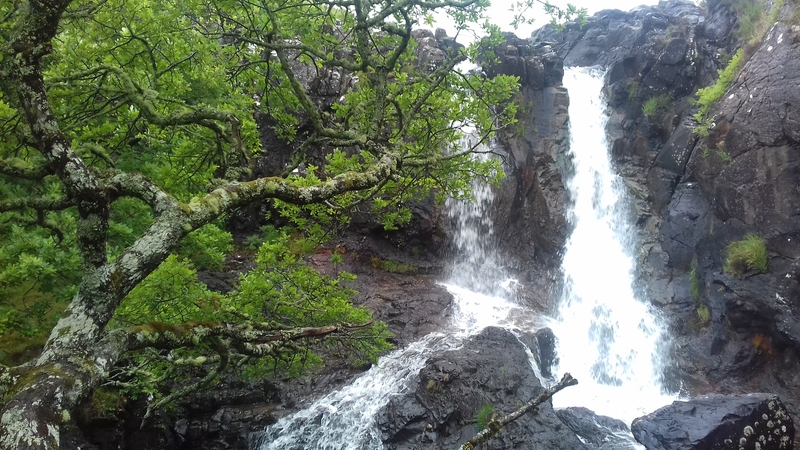 As we drove around the loch, we came across Eas Fors waterfall and a couple of other waterfalls between Killiechronan and Gruline. The trees around there are amazing. The weather has made them twist and go into dramatic shapes. They look a bit like Japanese Bonzai trees (but bigger). The road then cuts south between the mountains of Ben More and Bein na Srèine towards Loch Scridain, joining up with the main road again to Craignure (or you can head west to the ferry terminal of Fionnphort to travel to the island of Iona, which unfortunately, we didn’t have time to do on this trip). 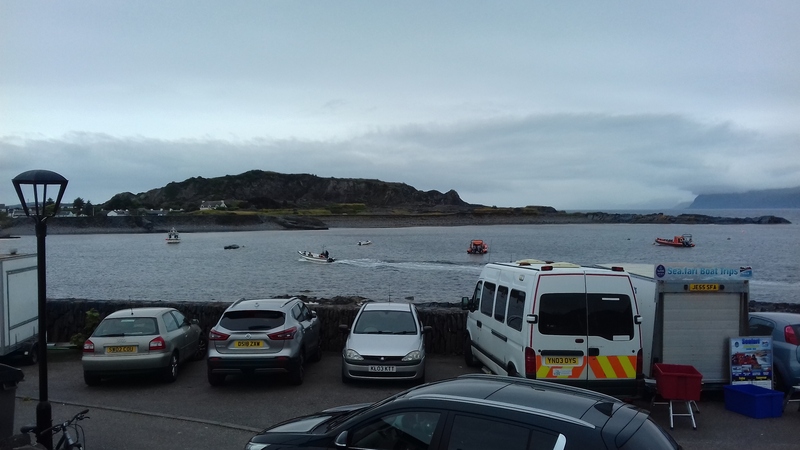 Our concert that evening was at Craignure Community Hall, tucked down between the police station and the campsite, with a view of the Mull Ferries coming and going. 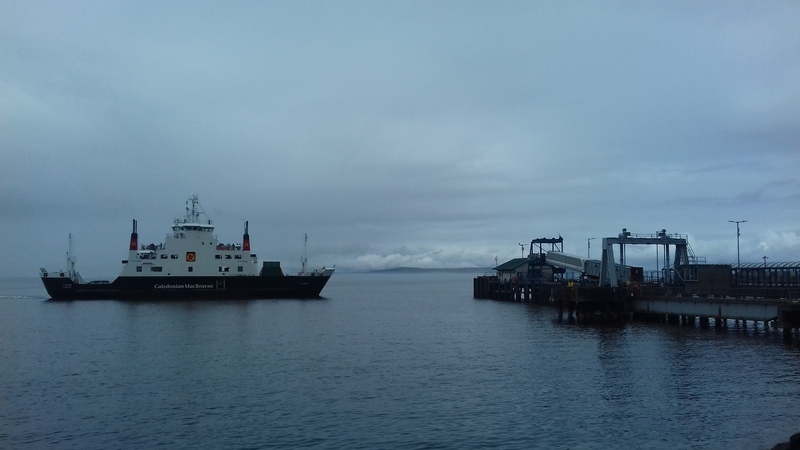 As the rain eased off, bats flew all around us, as we watched the last ferry of the day leave for Oban after the gig. The gig went down well and we met some very nice people. Here’s a photo taken by Sue Royle. Very nice acoustics in the 20 year old hall. 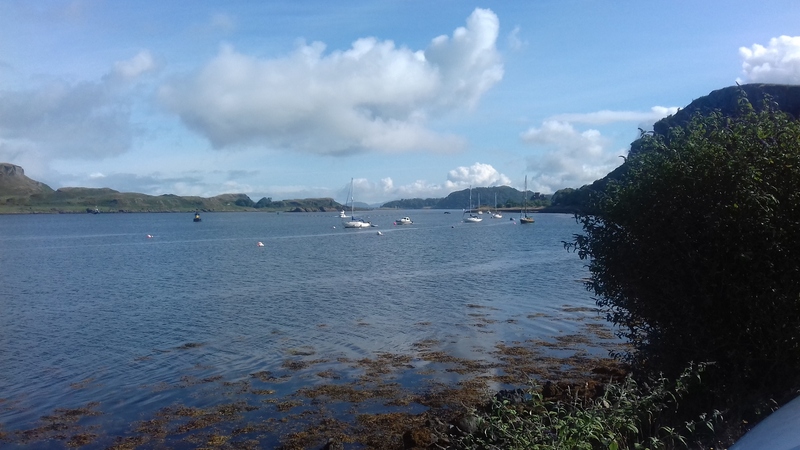 Sadly, we had to leave early the next morning for the 8.40am ferry back to Oban (you have to check in much earlier than that), so we had no more time to explore Mull. 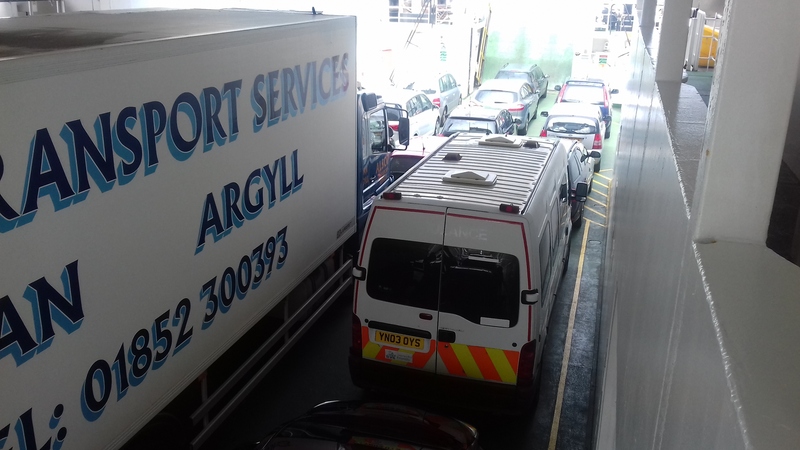 One advantage of our Tour Bus though – we sat and ate croissants and made real coffee whilst waiting in the queue for the ferry! 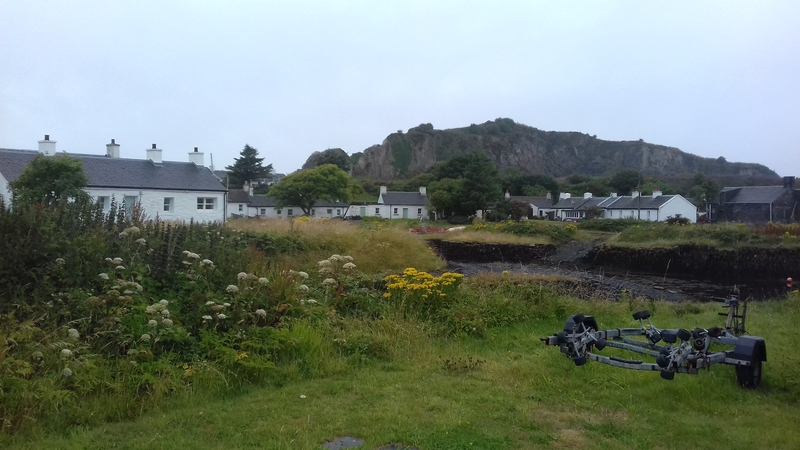 Saturday saw us on three islands! 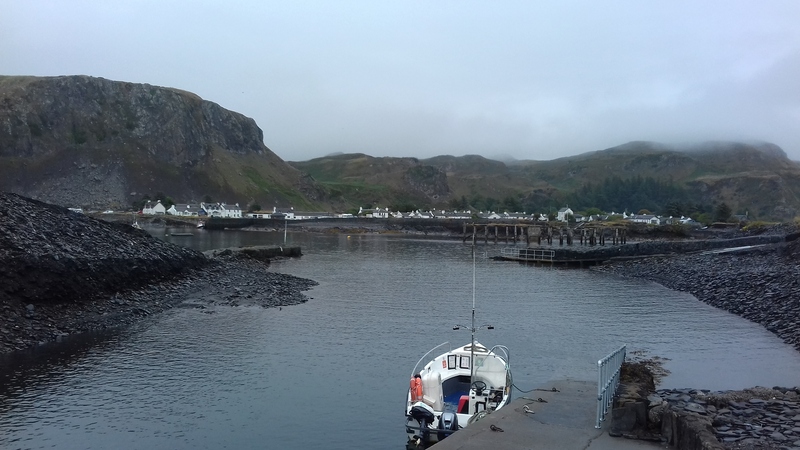 Mull, Seil Island (pronounced “seal”) and Easdale Island (the gig!). 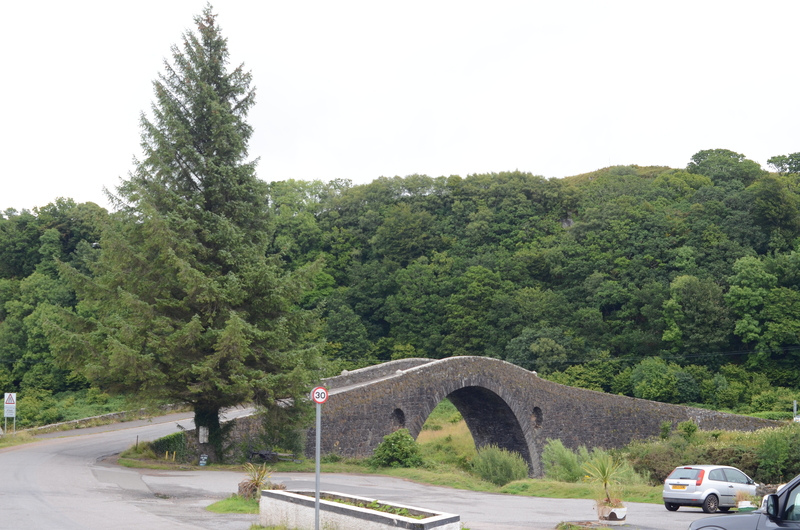 Just down from Oban you turn off at Kilninver to get to Seil Island by way of the Clachan Bridge – known as “The Bridge Over the Atlantic“, built in 1791. 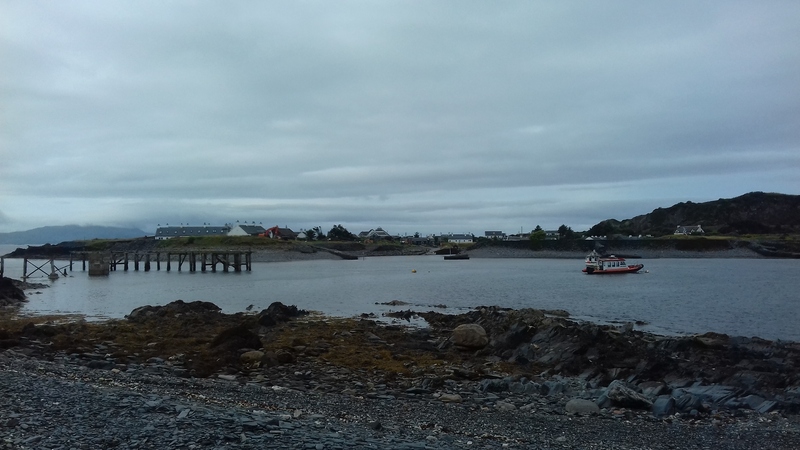 Across the bridge is the Tish-an-Truish Inn, where those involved in the 1745 Jacobite Rising, changed from wearing trousers back to their forbidden kilts! 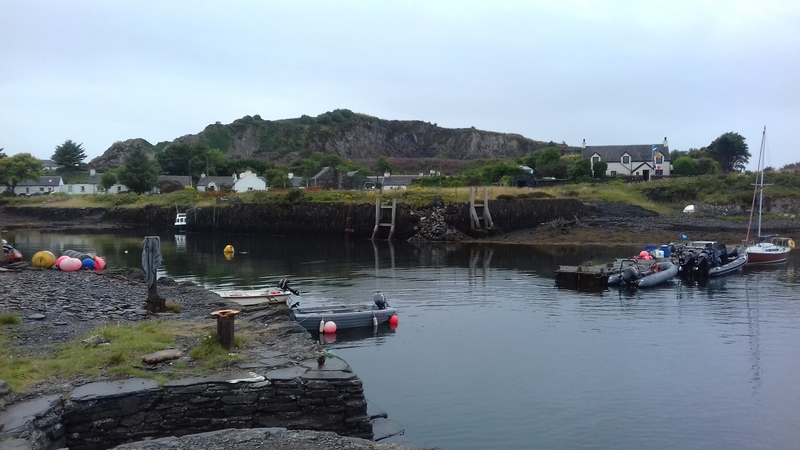 Following the road towards Easdale Island, we came to Ellenabeich, a village which owes its existance to the quarrying of Easdale Slate. 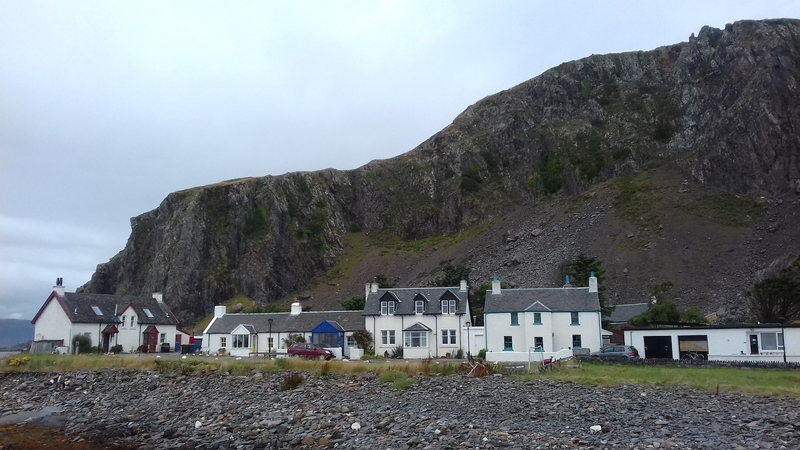 The cottages, built entirely out of slate in 1826, were built for the workers on the slate quarry. 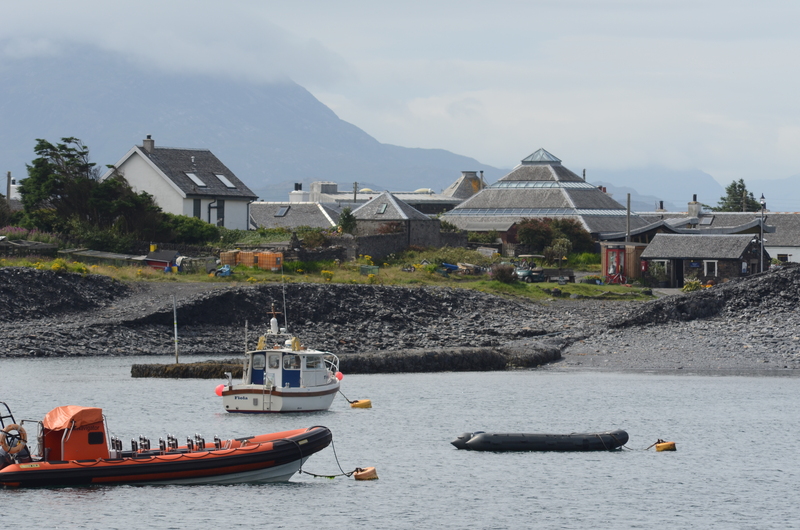 The harbour and many walls are all built of “dry stane” slate. 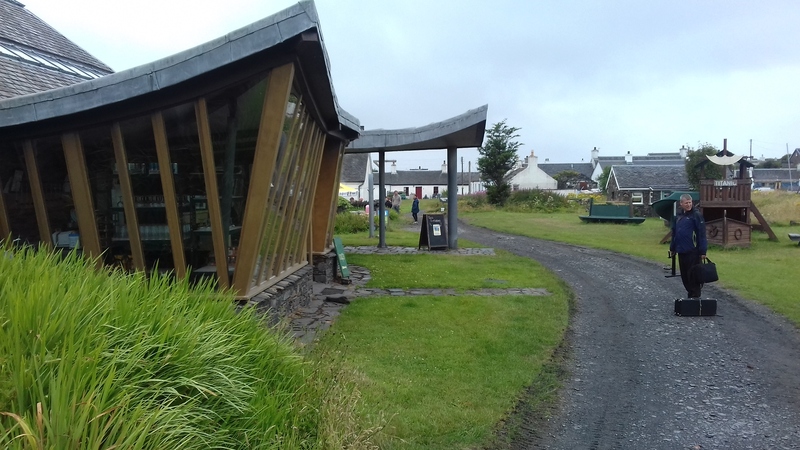 Slate has been extracted here from as far back as the 17th century. 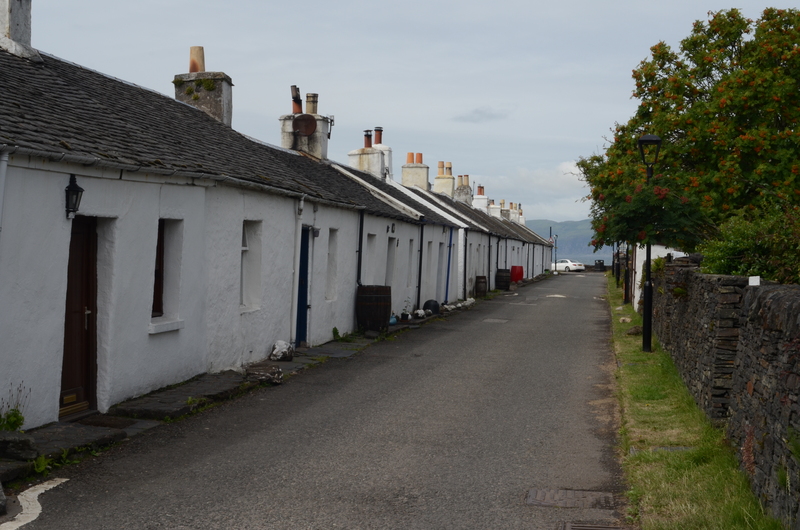 Between 1842 and 1861 over 130 million roofing slate tiles were produced here. 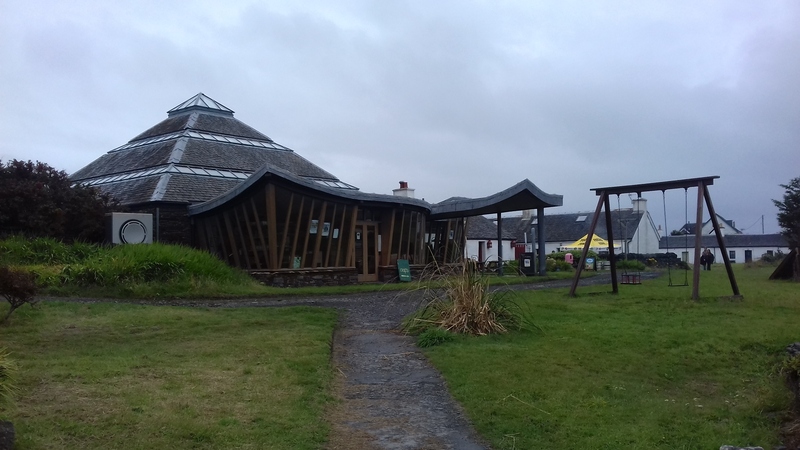 Easdale slate was used to roof the towns and cities of Great Britain and many places overseas. 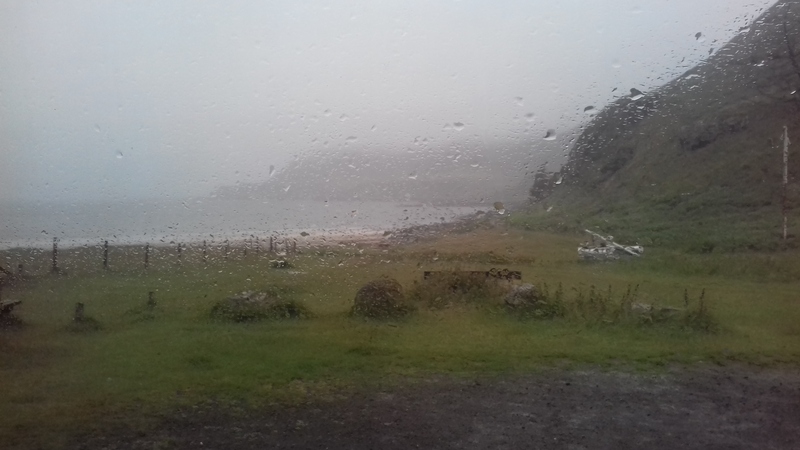 The quarry has now been flooded. 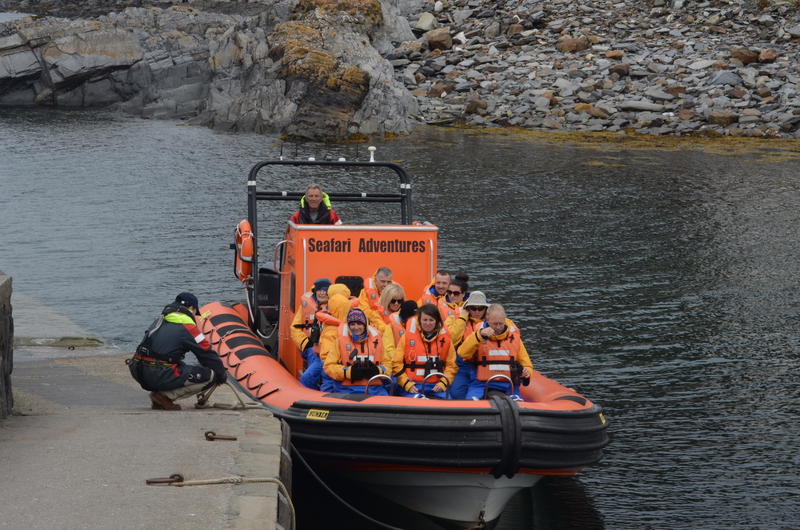 Seafari Adventures operate cruises to see whales, dolphins, seals, eagles, gannets and the Corryvreckan Whirlpool. 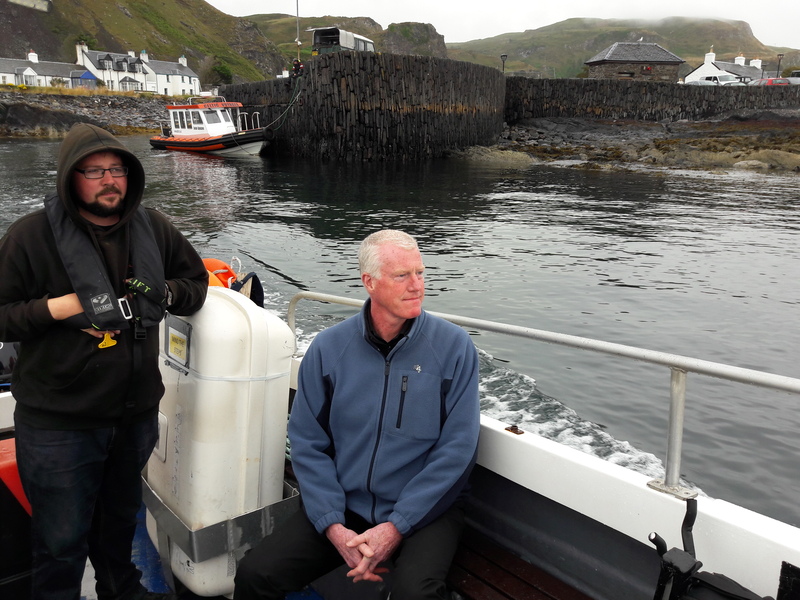 Ellenabeich and Seil Island were used as locations for the film “Ring of Bright Water” based on the book written by by Gavin Maxwell about his life in a remote house in coastal Scotland where he kept several wild otters as pets. 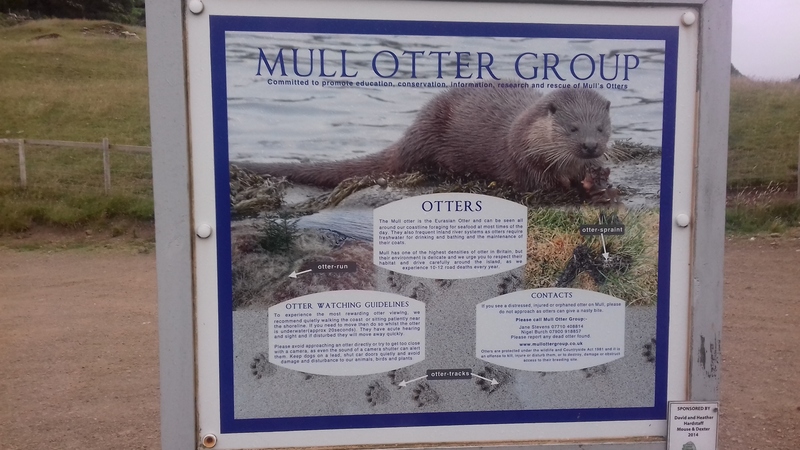 The film came out in 1969 and starred Bill Travers and Virginia McKenna (and “Mij” the otter), the film theme tune was sung by Val Doonican. 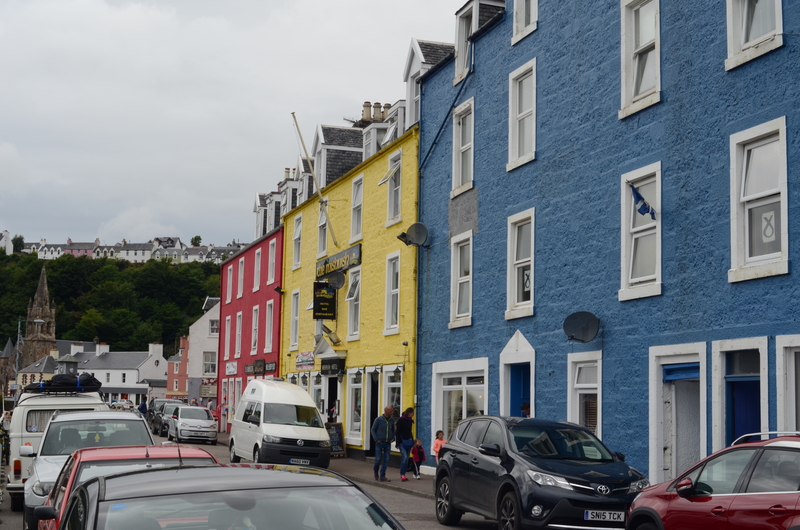 The Oyster Bar & Restaurant (see pic above) was the location of “M.A. Cameron General Stores” in the film. The story of the book/film is that Gavin passes a pet shop on his way to and from work every day in London, and takes an interest in an otter he sees in its window. Eventually, he buys the animal and names him Mij. 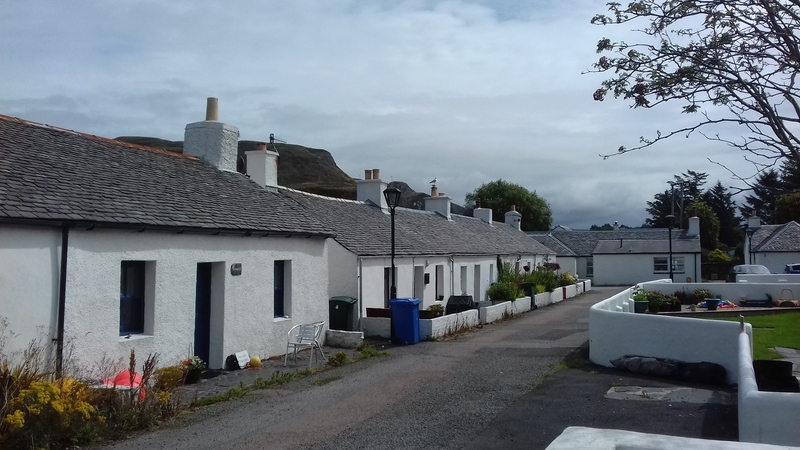 The otter wreaks havoc in his small apartment, and together they leave London for a rustic cottage overlooking the sea on the west coast of Scotland. There they live as beachcombers, and make the acquaintance of Dr. Mary from the nearby village, and her dog Johnny. 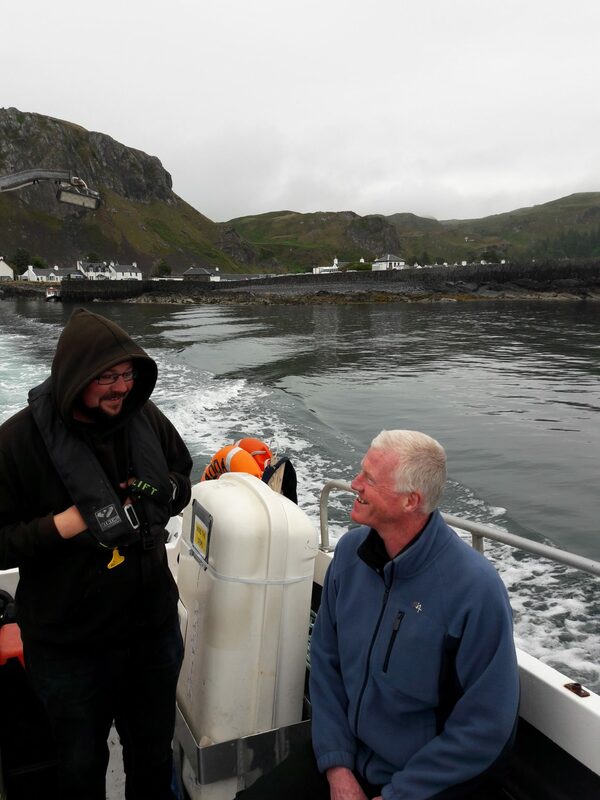 Mij and Johnny play in the water and bound across the fields together…..
To get to our gig on Easdale Island (Eilean Eisdale in Gaelic), we had to get the foot passenger ferry from Ellenabeich Harbour. There are no cars on the island. 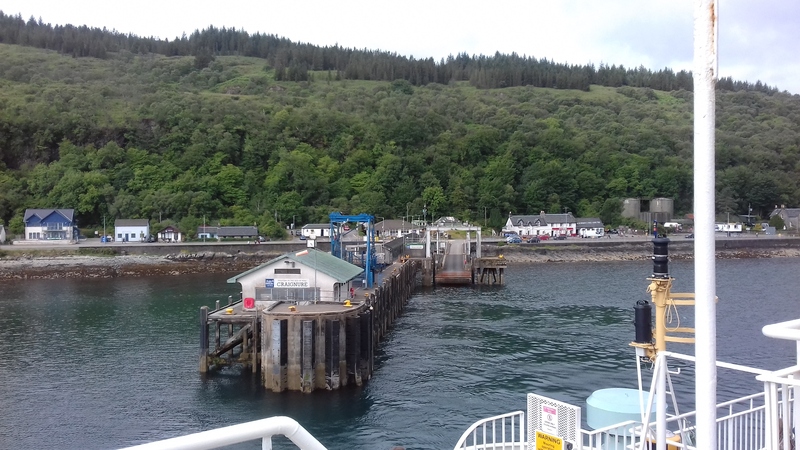 You summon the ferry by pressing a button that sounds a claxon across the water. Its a fantastic service these guys run. 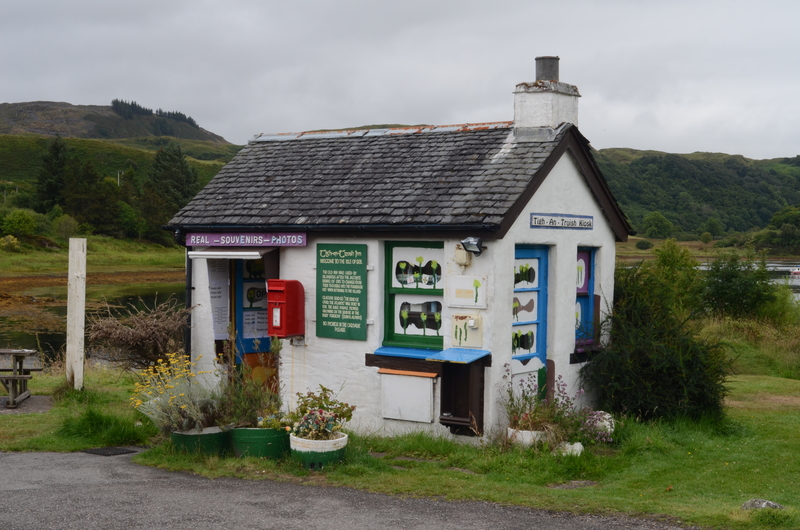 For a couple of quid return, they operate from very early in the morning until late. 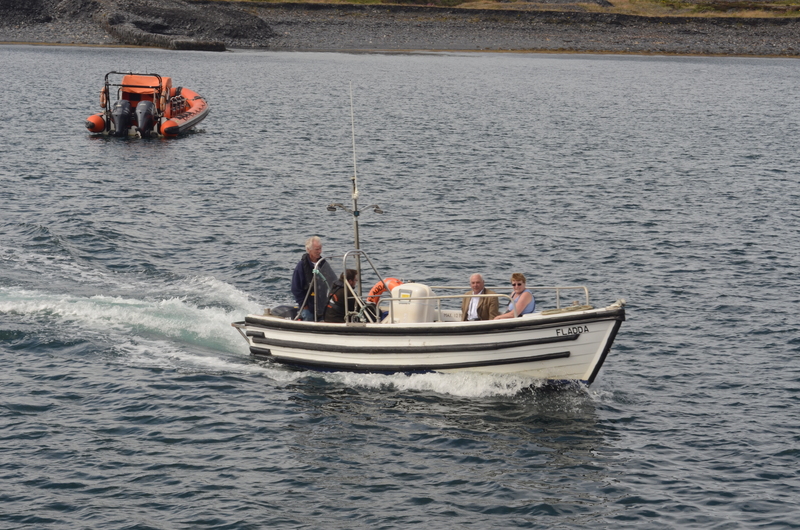 They’re very easy going and friendly – nothing seems too much trouble. 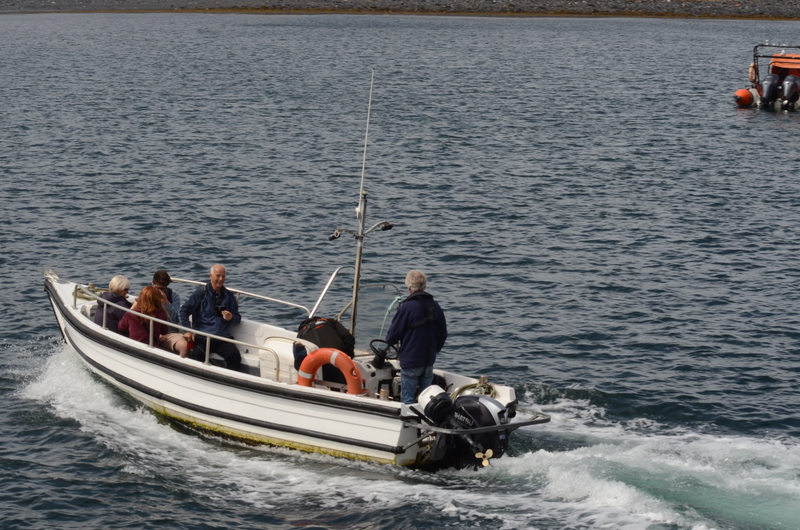 They put on a ferry at 11pm to bring us, and some of our audience back after our gig in the dark. 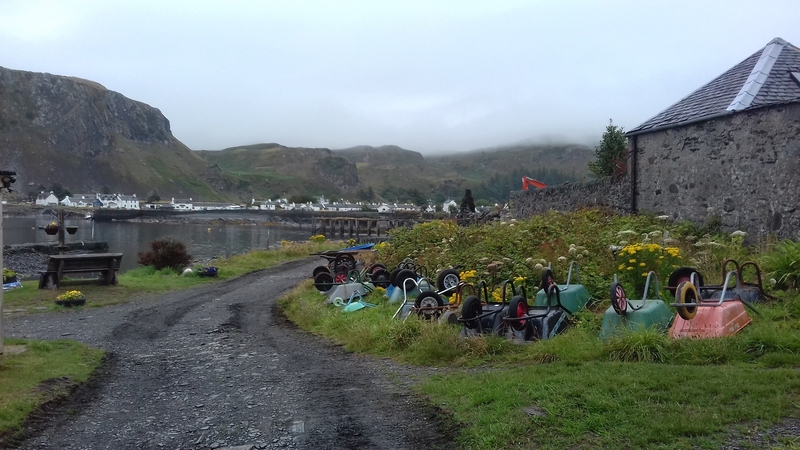 We arrived on Easdale Island a bit early so’s we could have a look around. 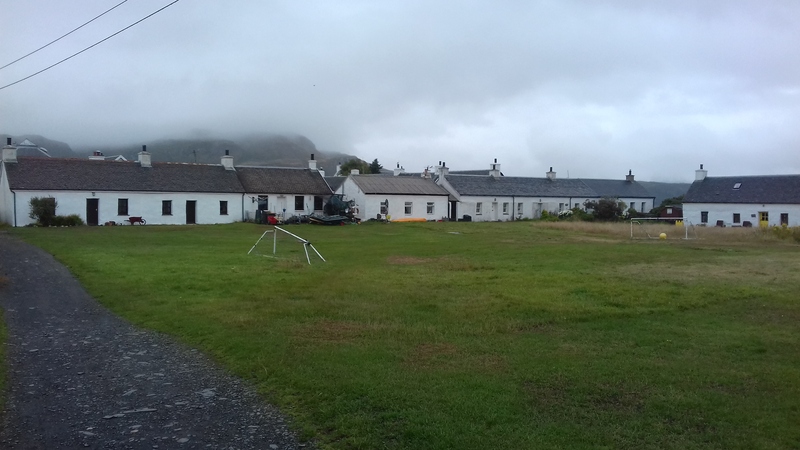 Again, the cottages had originally been built for the quarry workers. 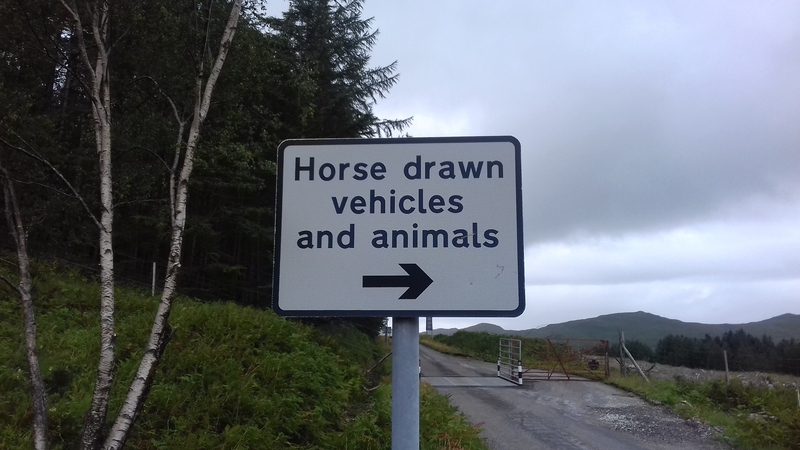 And of course, there are no cars there. 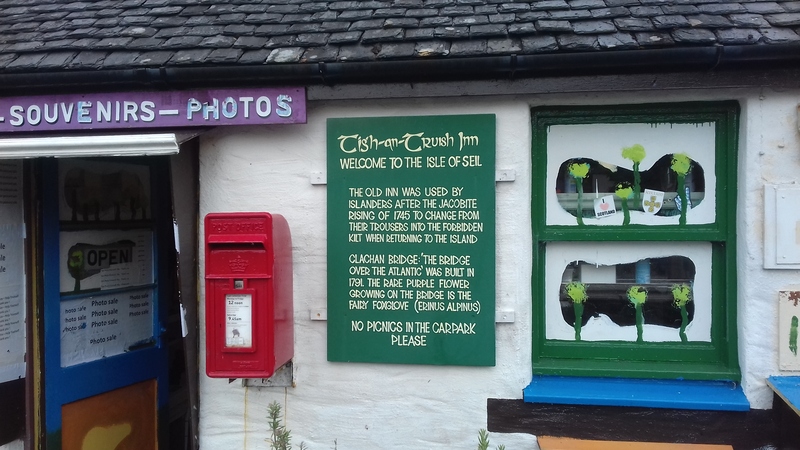 The island is famous for the World Stone Skimming Championships which are held there every year. Click here for more on that. 350 entrants gather every September to compete. 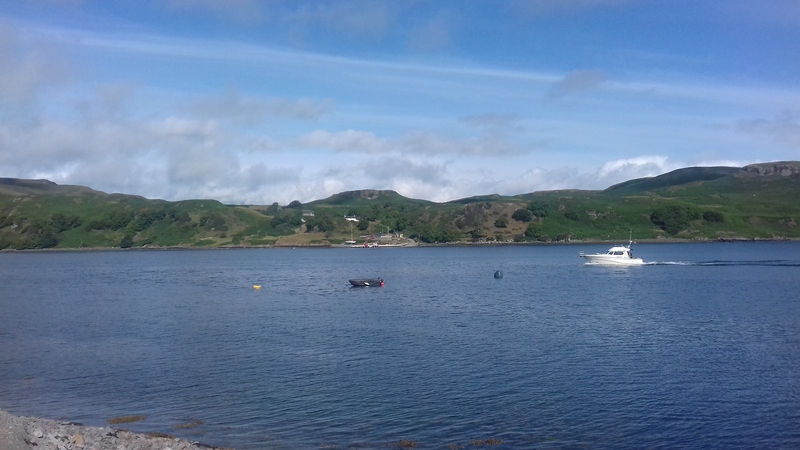 Of course, we had to leave our Tour Bus on Seil Island at Ellenabeich Harbour. 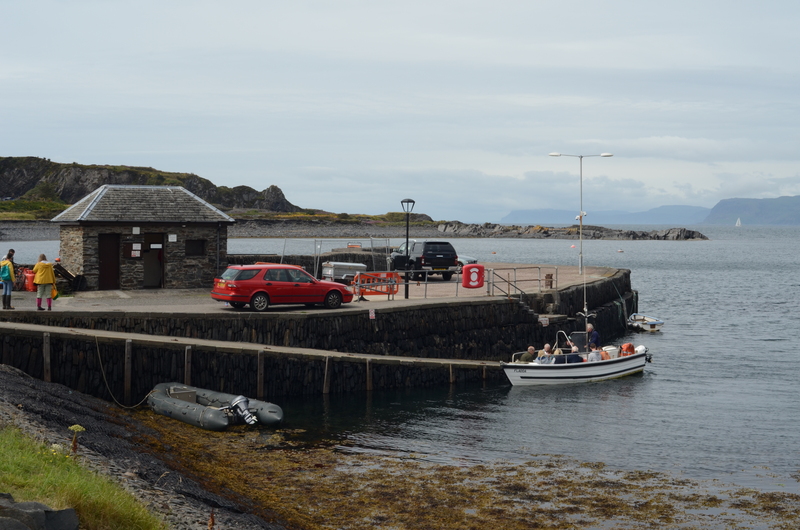 Our Tour Bus at Ellenabeich Harbour (most of the other cars there belong to the residents of Easdale Island). 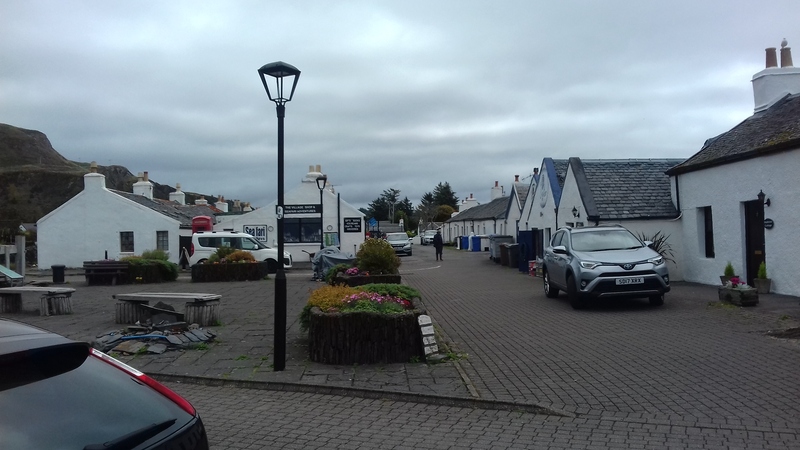 The trailer on the right of our Bus is where the Seafari Adventures operate from. Its a beautiful hall. Inside there’s a wooden mast in the centre from an old ship, and there are wooden beams and supports coming off that, and stone walls. Very nice…..and very nice acoustics. 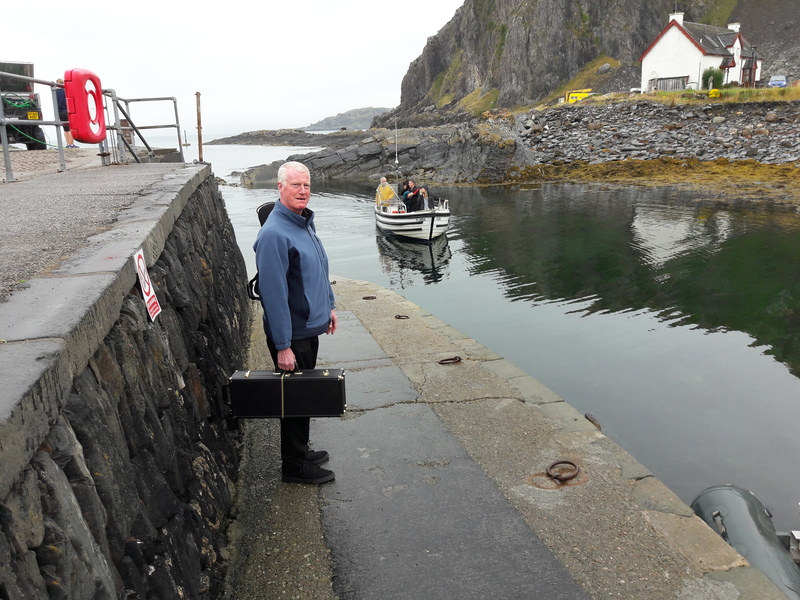 We thoroughly enjoyed our concert on the island, and met some very friendly people. 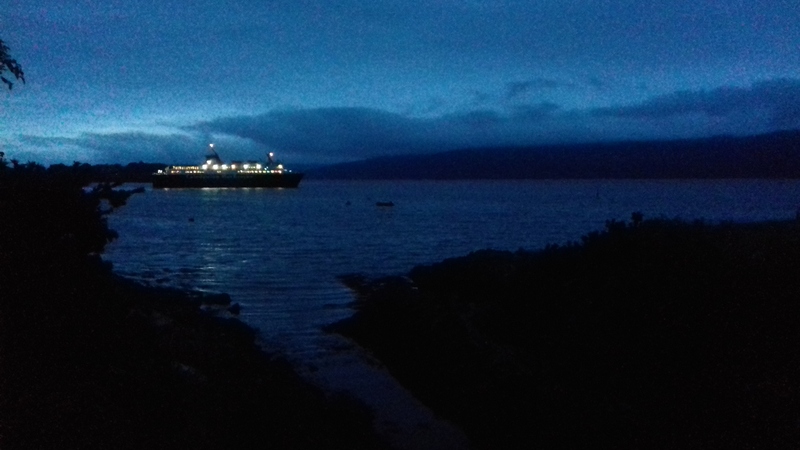 It was quite surreal getting back into the small ferry (in the dark) and sailing back to Ellenabeich at 11pm at night (along with a few of our audience members!). All in all, a magical experience, and one we’ll remember for a very long time! Sunday was the final concert of this trip. 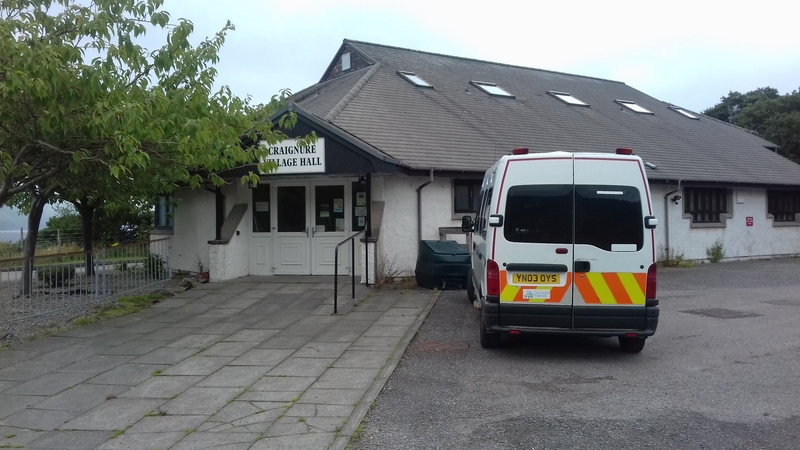 It was unusually, an afternoon concert at 2.30pm in Strachur near Dunoon. 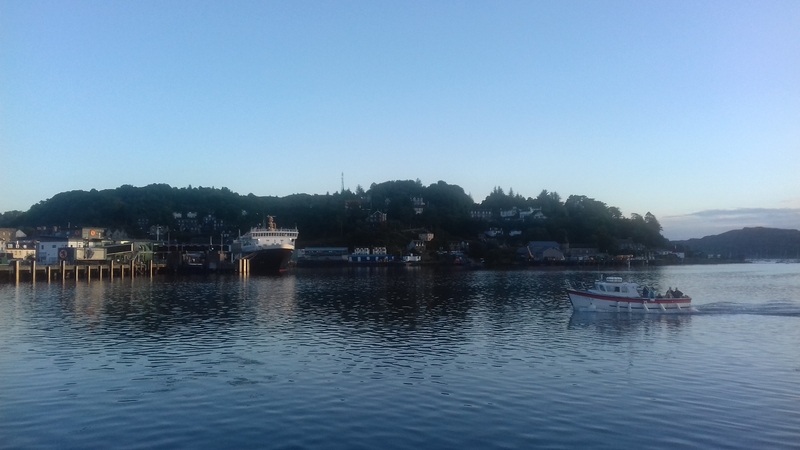 So we had to get up reasonably early and head off there via Oban and Inverary, around Loch Fyne to Strachur (trying to catch some of The Open Golf final round on the radio!). 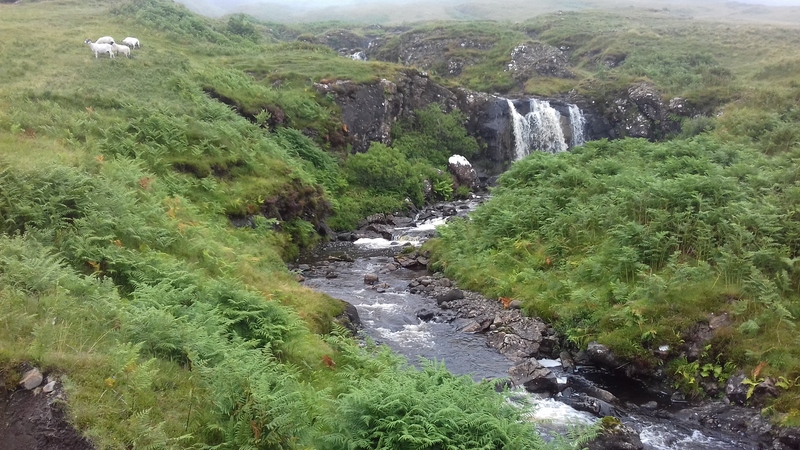 It rained most of the way. 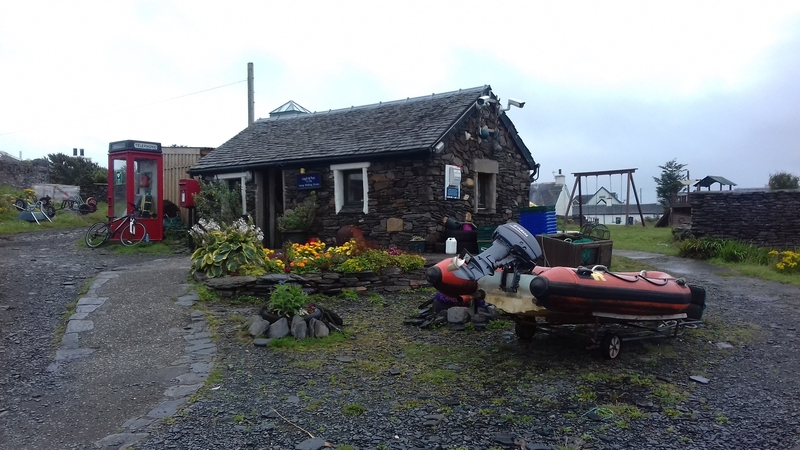 We were met with a very friendly welcome by the committee, one of whom we’d met before when she came to see us perform in the area a few months ago at Uig. Coffee and very, very light and tasty homemade “Strachur” shortbread was given to us! 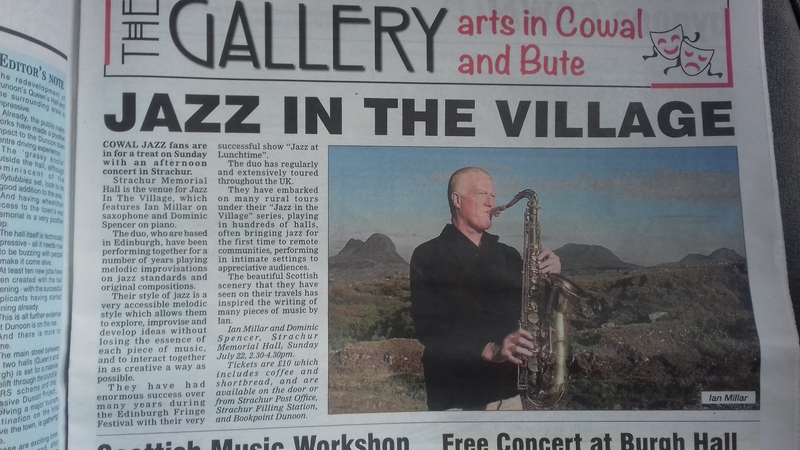 We got featured in the local newspaper – The Dunoon Observer. A good piece and a large photo! 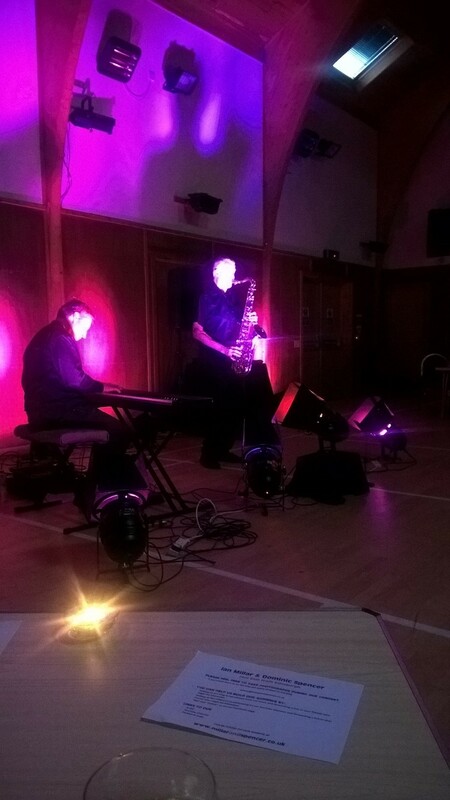 Again, we had a very warm reception from the audience, and then left for home in Edinburgh around teatime, arriving back at about 9pm. 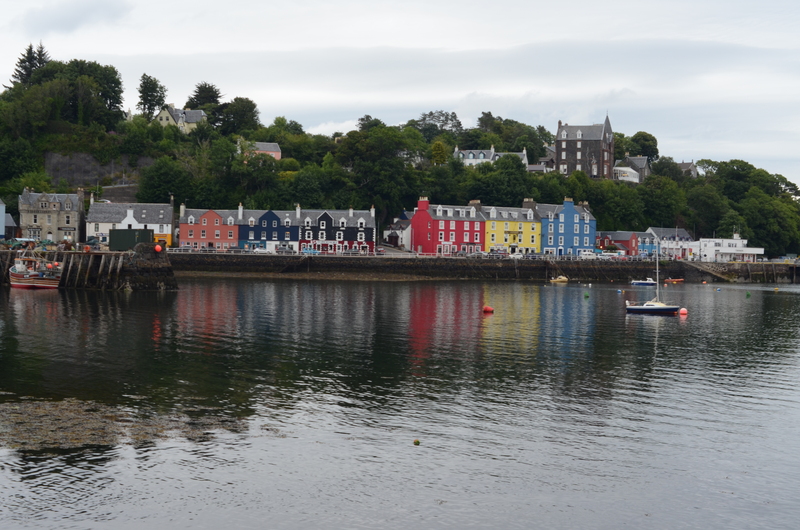 An amazing trip, with some stunning scenery, and very friendly people everywhere. We get paid for this…..? !